Time to hop in the ole time machine once again! But instead of zipping back to the seemingly usual timezone of Swedish death metal, we are setting the course for the USA back in the mid 2000s. If your mind went to metalcore, you’d be correct. Arrival of Autumn come in with their sophomore effort (and first for juggernaut Nuclear Blast Records) and whisk you away to the height of the metalcore movement. 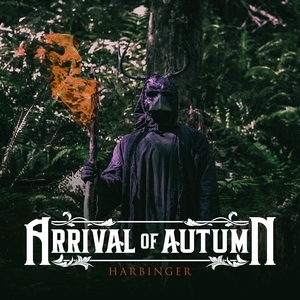 With immediate comparisons to bands like Killswitch Engage, Trivium, and All that Remains, Arrival of Autumn aren’t exactly flowing out of the stream of creativity. This is mid ‘00s metalcore drilled down to its most derivative qualities. Toss in a little bit of Darkest Hour’s slightly heavier (and more melodeath influenced) riffage in, and you’ve got Harbinger in a nutshell. Clean vocal choruses with an emphasis on the saccharine (see “Witness”), heavier riff verses (though thankfully with some actual blastbeats at points), a few breakdowns, and a formula that seems to run on empty after a few songs is exactly what you get. For what its worth, the formula still has its charms, but as the album drags on, the creative spark seems to diminish and the latter half of the album suffers from ‘cookie cutter-itis.’ While you can hear those direct, top shelf influences, the fact remains that all of these bands are still doing their thing and Arrival of Autumn don’t bring enough fresh ingredients to the table. For those who still love the metalcore era, Harbinger is speaking to you directly. But for anyone else, there’s not much here to grab your attention. It’s a nice throwback for a few songs, but fatigue sets in quickly and stomps out most of the momentum that is needed to carry an album like this.